Summary: "Lost and broken, Celaena Sardothien’s only thought is to avenge the savage death of her dearest friend: as the King of Adarlan’s Assassin, she is bound to serve this tyrant, but he will pay for what he did. Any hope Celaena has of destroying the king lies in answers to be found in Wendlyn. Sacrificing his future, Chaol, the Captain of the King’s Guard, has sent Celaena there to protect her, but her darkest demons lay in that same place. If she can overcome them, she will be Adarlan’s biggest threat – and his own toughest enemy. Celaena. Oh, Celaena. What I love about Celaena is that she is so difficult to describe. She is at once tough, hardened, angry, petrified, loyal, sarcastic, passionate, beautiful, willful, dejected, skeptical, and hopeful. She is hard and soft, both vulnerable and unapproachable, winning enemies and allies to her cause with her temper and her dedication. She feels like a whole person. And I adore her. This story is split in three ways: it tells Celaena's story across the sea, it tells the story of those she left in the glass palace, and it introduces a third perspective: a witch called Manon Blackbeak. The chapters in the glass palace were SO INTENSE. Bad stuff is happening there, and as a reader, I felt like it was just a matter of time before one of the major characters took a hit. And when it happened, OMG I WANTED TO DIE. The King of Adarlan is a Really Bad Dude. I am going to need to up my anxiety meds in order to cope with life until Book 4 is released. And then there's Manon. Considering that her story felt pretty detached from the other two, I was surprised with how interested I was. I kept waiting for her storyline to connect to the others in a more direct way. Though it didn't in this book, I'm certain it will in the future. I'm convinced that Manon has a heart, no matter how fiercely she denies it. Also, Ms. Maas can write one heck of a wyvern attack scene. Bottom Line: This series gets better and better with each installment. 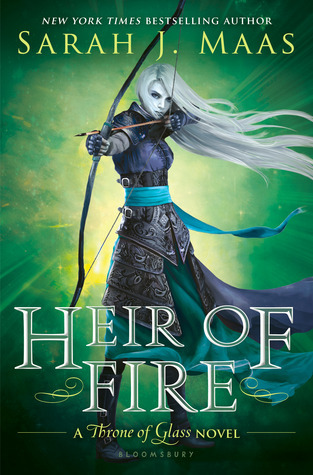 The action, the scheming, the magic, the characters, the gauntlet being THROWN THE HECK DOWN... At the end of this book I was a frayed disaster from FEELS OVERLOAD but IT WAS WORTH IT. GIVE ME BOOK 4 IMMEDIATELY. I agree with everything you said! LOVE THIS SERIES!!! I read The Assassin's Blade this week. Have you read that? It is just as amazing! Yes! Another ToG fan!! I actually haven't read The Assassin's Blade yet. I'm not a big novella person, but I've enjoyed this series so much that I think maybe I should give it a shot.